Adventurer David Hempleman-Adams has a new challenge - to take a hot air balloon with a wicker basket higher than anyone else. The current record stands at nearly 11,000 metres. 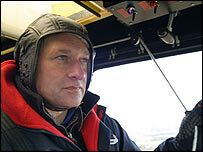 Hempleman-Adams, from Wiltshire, will have to fly into sub-zero temperatures wearing an oxygen mask to achieve the feat. He has already climbed the highest mountains in all seven continents; walked to the North and South Poles and was the first person to fly solo in an open wicker basket across the Atlantic. The explorer told the BBC: "The temperature will be minus 60 or 70 degrees Celsius, but I won't be up there for that long so it shouldn't be that bad. Oxygen will be critical." The record breaking attempt will take place in March near Denver, Colorado in the United States.